Karber's Blog: Karber Weekly Challenge 17: Fantasy! Karber Weekly Challenge 17: Fantasy! Hi there! The theme for The Karber Weekly Challenge is Fantasy! 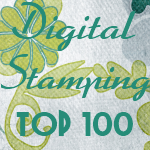 In Karber Shop you can find a wide variety of digital stamps related to this fun theme! Like Twilight, Harry Potter, Fairies, Angels, Princess, and more... Visit The Karber Weekly Challenge blog to see the cards of our designers.